The green mango salads will blow you away with its taste bud awakening flavors as well as with the mix of textures. A bonus point about this salad is great healthy and low calories / low fat. Some people also choose to make a complete meal with salad by add more ingredients. For instance cooked shrimp, cooked chicken, grilled tofu, etc. 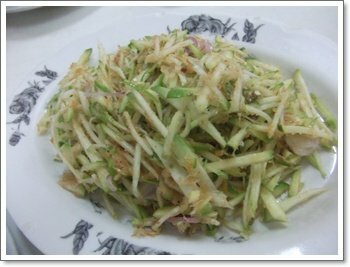 This salad is also very interesting, as it has sweet, sour and feeling fresh. Before we see the green mango salad recipes, I would like to give you how to choose the right green mangoes to make the salad. The mango has to be very firm and green, it should not be soft or ripe because it is very difficult to shred / cut them into pieces and not delicious when you eating. Put shredded mango in a mixing bowl, add roasted grate coconut and ground dried shrimps. Mix all lightly. Combine the dressing ingredients and the mango salad together, put the salad on a plate. Topping with dried red chili pepper and sliced shallots. I simply love the color of this salad, it is absolutely enticing. These are some of the basic healthy recipes to make green mango salad. You can add other vegetables to the salad as well. Cooked shrimp also make a wonderful combination with the green mango salad. If you serve this salad to the guests, they can pick up this salad by using fingers and they will lick their fingers and ask for more ^-^.